Aromas is a popular hangout on the USD campus as well as a place to grab a quick coffee or tea and go. University of San Diego (USD) students and staff looking to grab a gourmet coffee or tea without the hassle of waiting in line can now self-pour their favorite beverage from a tap wall at the school’s Aromas café, and have the amount automatically charged to a special declining balance account. The system was implemented last year following a remodel of Aromas. First, a customer purchases a sticker containing a RFID (Radio Frequency Identification) chip at the Aromas counter, then sets up and loads a declining balance account associated with the chip. The person is then free to pour beverages from any of the six spouts arranged along the tap wall in any quantity up to the value of the funds in the account. To initiate a transaction, the RFID-bearing sticker—generally affixed to an ID card—is tapped against the iPad-based reader at a specific spout and the account is then charged by the ounce for the amount of beverage dispensed. The RFID-based self-serve system allows customers to get as much or as little as they want and be charged only for what they dispense. The taps feature a range of cold brew coffees and chilled teas from local firm Ryan Bros. Coffee, which is family-owned by a USD alumnus. Aromas is open 7 a.m. to 11 p.m. Monday to Thursday and 7 a.m. to 3 p.m. on Friday. It is closed weekends. Students can pour their beverage of choice in any quantity into any containers they want. Aromas makes reusable Mason jars available to those who stay on the premises as a way to reduce waste. There is some turnover in the selections, Ramos says. While the most popular three or four choices—regular cold brew, the very popular vanilla latte, chai latte and the ultra-high-antioxidant-laden “super green bean” cold brew—remain in place, the others are switched out to test new flavors and varieties. “We are able to track the amount poured from each tap, so we know which ones are the most popular, and changing out the kegs is pretty easy,” Ramos observes. Not that students stick with the basic choices, though. In fact, one popular option is to mix and match the different beverages and come up with unique combinations, not unlike what regularly happens with the Coke Freestyle machine that sits next to the tap wall and serves as an ice dispenser for tap wall customers. Ramos says the idea of the self-serve taps sprang from the dining team’s determination to improve the customer experience as part of the Aromas remodel. Well, in a way. More to the point, it led to some of the San Diego area’s brew houses and pubs. The self-serve system debuted when the remodeled Aromas opened last year, giving what was already a fairly popular campus coffeehouse an added jolt of convenience and variety. 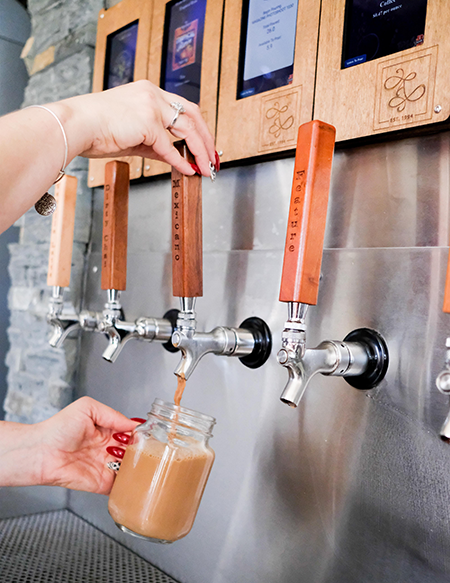 The convenience of self-service combined with a wider variety of cold-brew options available—previously there was only plain—have served to boost sales at the venue.